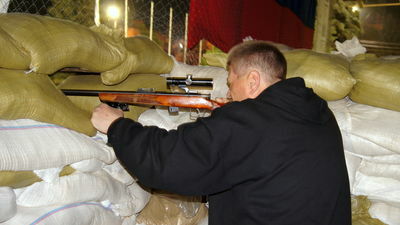 Vyacheslav Ponomarev, mayor of Slavyansk, is one of the pro-Russian rebel leaders. 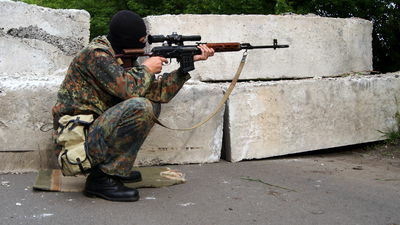 He is posing with a rifle. 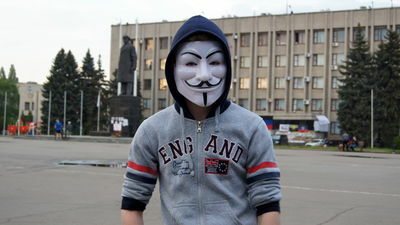 A young man on the central square of Slavyansk, near the Lenin monument and the city hall, currently occupied by pro-Russian rebels. 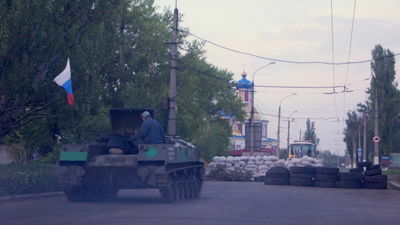 An armored vehicle of the pro-Russian rebels of the "Donetsk Republic", at a checkpoint near Slavyansk. 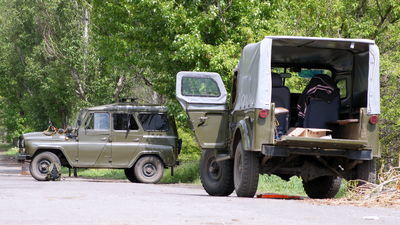 Сars of rebels of "Donetsk Republic", north of Slavyansk. 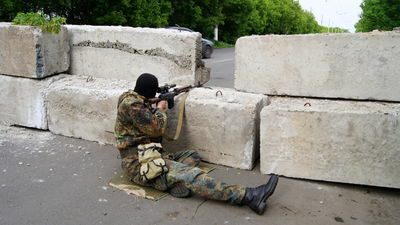 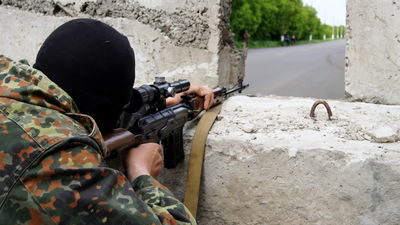 A militia man of the "Donetsk Republic" with a riffle at a checkpoint near the northern border of Slavyansk. 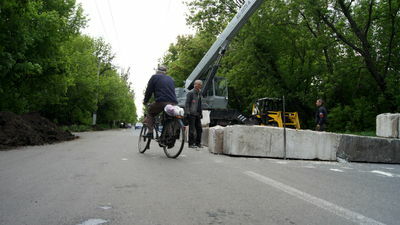 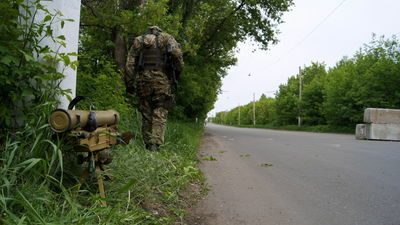 Pro-Russian rebels are building a check point in the northern outskirts of Slavyansk. 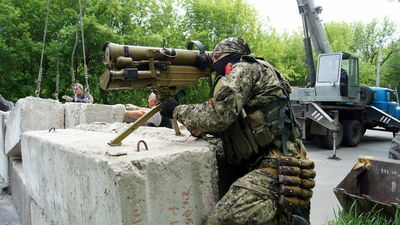 A militiaman of "Donetsk Republic" with a Russian anti-tank missile system 9K115-2 Metis-M at a checkpoint near the northern border of Slavyansk. 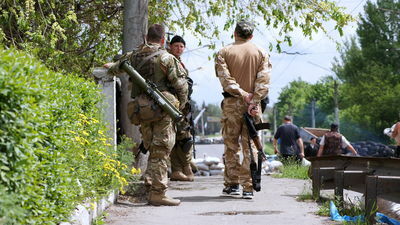 Pro-Russian militia men with a grenade launcher and Kalashnikovs, north of Slavyansk. 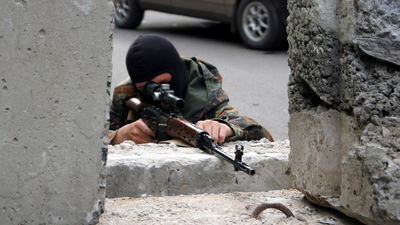 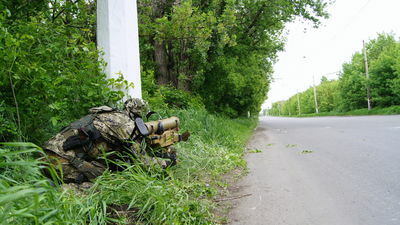 A pro-Russian militia man with a sniper rifle at a checkpoint near the northern border of Slavyansk. 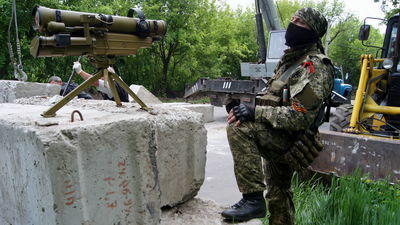 A militia man of the "Donetsk Republic" with a Russian anti-tank missile system 9K115-2 Metis-M at a checkpoint near the northern border of Slavyansk. 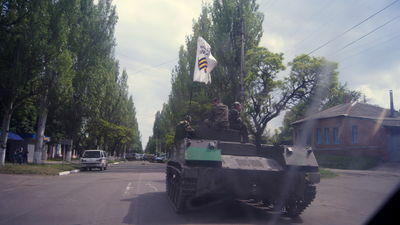 The armored vehicule of pro-Russia rebels of the "Donetsk Republic" going to center of Slavyansk. 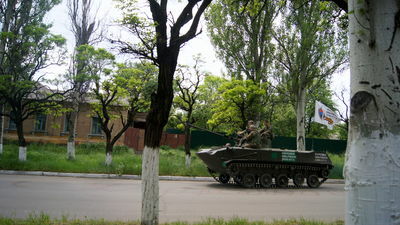 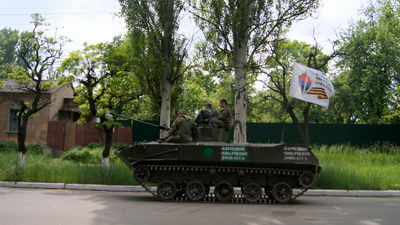 Pro-Russian militia men patrolling Slaviansk in an armored vehicule.